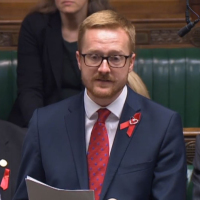 Lloyd Russell-Moyle, Labour MP for Brighton Kemptown, stands up in the House of Commons and speaks about his HIV Positive status. A leading charity has praised the actions of Lloyd Russell-Moyle, saying the Labour MP had "done everybody a service" by disclosing his HIV status. The MP's emotional admission in the House of Commons ahead of World Aids Day (December 1) "does a lot to normalise HIV in the public's mind", said Ian Green, chief executive of the sexual health charity the Terrence Higgins Trust. He said public figures such as Mr Russell-Moyle talking about their views of experiences with HIV "does a huge amount" to tackle the stigma that is still associated with the virus. Mr Green also praised the Duke of Sussex, who has done significant work with HIV and Aids charities, including releasing a video earlier this month calling for better access and visibility for HIV testing. In the video, which marked National HIV Testing Week, the prince said people should not be ashamed or embarrassed about taking a test, and instead should treat it in the same way as people protect against "viruses like cold and flu". Mr Green said: "When Prince Harry publicly speaks about taking an HIV test, or last week helped us launch HIV testing week, or when he talks publicly about HIV being nothing to be feared, that does a huge amount to tackle the stigma associated with HIV. "When public figures talk about their own views or experiences that goes a long way to deal with the issue." On Mr Russell-Moyle, he added: "I think he's done everybody a service about talking about his own personal journey with HIV. "I think he has taken a very important decision for him, and from talking to him I know the reason he wants to do this is because he wants to tackle the stigma associated with HIV head on." The Terrence Higgins Trust is running a "Zero HIV" campaign to mark World Aids Day, with the aim of ending new cases of HIV and eliminating stigma surrounding the illness. Commenting on the MP's announcement, Deborah Gold, chief executive of National Aids Trust, said: "Although no one is obliged to be open about their status, and it isn't always an easy decision, the same stigma that makes it hard to say you have HIV is a stigma that is gradually eroded by people being open and proud. "HIV, as Lloyd shows us, is no longer a death sentence and for most it no longer even significantly compromises their health. "It is a manageable condition; illness and the risk of passing it on to others can be completely averted with simple daily medication. "These simple messages can be a powerful antidote to HIV stigma. As the first MP to disclose their HIV status in the House, Lloyd has taken a big step and we absolutely applaud him." If you're living with HIV and looking for travel insurance that meets your needs, check out our dedicated HIV medical travel insurance and get the right cover for you.